Many tribologists are today not only explicitly concerned with interface action but also with interface composition. 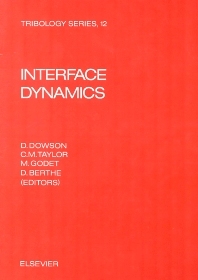 This proceedings volume presents a timely review on topics ranging from interface dynamics to interface elimination, covering all factors such as contact stress fields, interface rheology, and boundary slip, that control the passage from formation to elimination. The volume contains 45 papers divided into 13 sessions, that were presented at the symposium. I. Pictures in Tribology. Shear behaviour of an amorphous film with bubbles soap raft model (D. Mazuyer et al.). Optical studies of the wear of polymers against glass (S. Taheri, D. Dowson). Interface dynamics in polymer friction (L. Vincent, N. Dahmani). Boundary conditions: adhesion in friction (Y. Berthier et al.). II. Fracture Mechanics. Measurement of propagation initiation and propagation time of rolling contact fatigue cracks by observation of acoustic emission and vibration (T. Yoshioka, T. Fujiwara). Surface fatigue considerations in fretting (D.A. Hills et al.). Crack behaviour under cyclic loading (M.C. Dobourg et al.). III. Lubricant Rheology I. Redistribution of solidified films in rough Hertzian contacts. I. Theory. (B. Jacobson et al.). Redistribution of solidified films in rough Hertzian contacts. II. Experimental (B. Jacobson). A contribution to the study of shear rheology of grease (L.A. Ferreira et al.). IV. Powders. Granular flow as a tribological mechanism - a first look (H.G. Elrod). Experiments on the rapid shear flow of metal powders (K. Craig et al.). Unlubricated fretting wear of mild steel surfaces in air at room temperature. III. The conversion of (artificial) metallic wear particles to oxide (R.E. Pendlebury). Fractals: a method of characterisation of third body morphology (Y. Berthier et al.). V. Particle Detachment. Crack propagation and particle detachment in the wear of glass under elastic contact conditions (J.K. Lancaster). Formation of wear fragments by fracture processes in abrasive contacts (B. Lamy, T. Mathia). True normal loading at asperity contacts (D.F. Moore). VI. Load Carrying Mechanisms I. Behaviour of non-Newtonian lubricants in rough bearing applications (L.A. Abdel-Latif et al.). On the flow perturbations and friction reduction introduced by surface dimples (G.K. Rightmire et al.). Roughness effects on interface dynamics (M. Chambat, G. Bayada). On the mechanism of operation of flat land bearings (H. Heshmat). VII. Lubricant Rheology II. Rheology of reaction films formed by ZDDP (A.F. Alliston-Greiner et al.). Some comments on the glassy state'' of lubricants in an EHD contact (P. Bezot et al.). A model for the flow behaviour of multigrade lubricants (L. Rozeanu, M. Maayan). Influence of lubricant on temperature generated in elastohydrodynamic contacts (P.M. Cann, H.A. Spikes). VIII. Stresses. 3-Dimensional method of studying three-body contact geometry and stress on real rough surfaces (M.A. West, R.S. Sayles). Deformation mechanisms and stresses created by third body debris contacts and their effects on rolling bearing fatigue (J.C. Hamer et al.). Roughness frequency analysis and particle depth (A. Carneiro-Esteves et al.). IX. Third Bodies I. Study of particle detachment and surface transformation of sintered silicon nitride with cathodoluminescence and scanning acoustic microscopy (P. Kapsa, Y. Enomoto). Three-body interaction in metal-ceramic and ceramic-ceramic contacts (K. Holmberg et al.). Tribological surface layers in fretting of ceramics (D. Klaffke). Variability of wear rate data in simultaneous experiments (A.J. Winn). X. Boundary Conditions. Influence of surface preparation on friction of nylon 6-6 against steel (L. Vovelle, J.M. Martin). Influence of the water vapour adsorption on the boundary conditions in tribology (J. Lepage, H. Zaida). Velocity measurements in grease lubricated contacts under sliding conditions (S. Mutuli et al.). XI. Load Carrying Mechanisms II. Properties of ultra-thin lubricating films using wedged spacer layer optical interferometry (H.A. Spikes, G. Guangteng). Load carrying in slow reciprocating mechanisms (G. Lofficial et al.). Influence of the pressure dependence of the surface films Young's Modulus on its protective properties (J.L. Mansot). XII. Third Bodies II. Generation of agglomerate oxide plateau under conditions of low load and speed (S.G. Hodgson, J.L. Sullivan). Correlation between wear rate and structural data of debris (M. Belin et al.). Role of surface texture and its characterisation in monitoring cylinder liner manufacture and wear performance prediction (K.A. Stout, C.H. Bovington). XIII. Mechanisms. Investigation of the degradation parameters towards the surface failure in an EHD contact (E.Y. Akl et al.). Some effects of hardness and microstructure on the lubricated wear of steels (J.C. Bell, M.N. Richards). Interface composition in Hertzian contacts: Application to the camtappet system (G. Monteil et al.). Written discussion and contributions. List of authors. List of delegates.